If you are making a family video which is simply a documentary type observation of events which are occurring around you, the dialogue will usually be unscripted comments and conversations which take place naturally. These can often be very amusing, especially if it’s something young kids comes out with. However, if you’re intending to write a screenplay where you’re creating fictional characters, it is crucial to be able to follow some golden rules when writing dialogue if you’re going to maintain the interest of the audience. What Does Good Dialogue Achieve? There are numerous purposes served by the effective use of dialogue. It speaks volumes about a person’s character and gives you an insight into their personality. It can also serve to establish relationships between different characters for the benefit of the audience and can convey emotions which are important in understanding the context in which the film has been set. 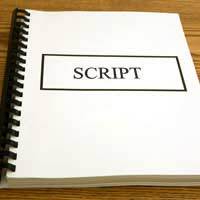 In terms of writing a good screenplay, one of the major components when you are considering your story or plot is to set up some kind of conflict or obstacle which one (or more) of your leading characters is going to have to overcome. In doing that, you’re going to need to let the dialogue reflect the way in which one particular character is likely to respond to another who might be on opposite sides of the conflict. In that way, you can push the story along towards its ultimate climax. If you’re new to screenwriting, you’ll immediately become aware just how much writing and speaking are totally different. You’ll probably notice when you write a piece of dialogue to be spoken by a particular character that when you read it back to yourself out loud, you’ll almost certainly be able to tell that what you’ve wrote in no way reflects the reality of what your character would say. Regional dialect and slang terms and also the way in which we all tend to speak in incomplete sentences when in casual conversation are all things that you’ll need to take into account when writing dialogue if you want it to sound realistic. The dialogue needs to be interesting and should serve to move the story along too. For example, if you take an average fly on the wall conversation, you’ll often find that it’s not that particularly interesting. Yet dialogue needs to be funnier, more poignant, cleverer and more concise and to the point than it would otherwise be naturally, if you want to keep your audience engaged with the video or film you’re making. That said, clever screenplay writers will also adopt a strategy of including dialogue which has the audience guessing as to what the character is actually getting at leaving them unsure as to what might happen next which is more likely to leave the audience intrigued. Good dialogue also needs to differentiate between characters. This is something you must remember as a screenwriter. Before writing a passage of dialogue for a character, you need to ask yourself how that character would speak. For example, how they’d construct their sentences and the types of words they’d use. Some of the old period dramas are good examples of this where the dialogue spoken by, say, the ‘lord of the manor’ is obviously going to differ from that of, say, the parlour maid. Is the dialogue already explaining what the visual elements of the scene are doing naturally? If so, cut it. Is the dialogue longer than 4 or 5 lines? If so, is everything necessary or can this be trimmed? Does the dialogue sound natural? If not, rewrite it. Also, don’t simply create dialogue just because a person happens to be in a particular scene. Screenwriting is not about giving an equal amount of words do each character. Some parts require more dialogue than others.